Today we’re proud to announce the launch of Live streaming with Pokeit. Live streaming with Pokeit makes it easy to share information about a poker session with an audience. 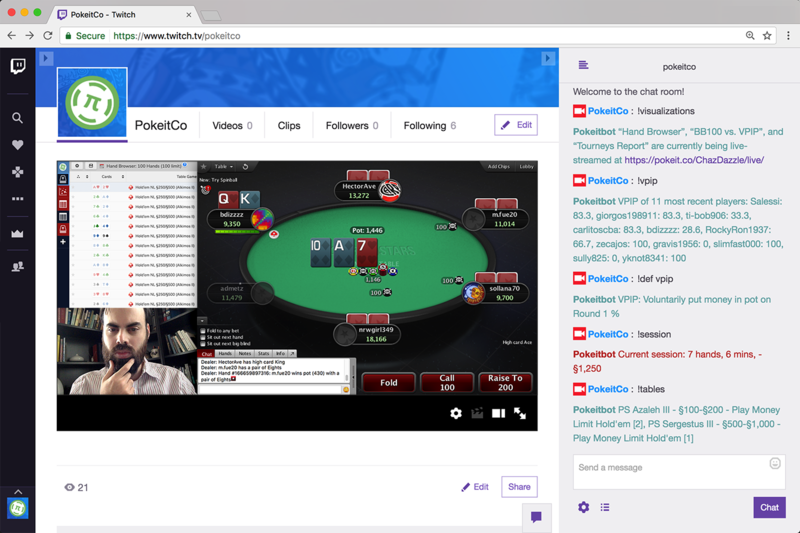 This new service includes two major components: a chatbot for Twitch called Pokeitbot that will respond to commands regarding your current session of online poker, and a live homepage where you can publish graphs and reports to the web. Both products are now available for all Pokeit members at no additional cost. We begin this blog post with a brief overview of poker streaming on Twitch. Next, we identify how the lack of poker-specific tools for live streaming is limiting audience engagement. We then introduce the solution, Live streaming with Pokeit, which includes the Pokeitbot chatbot, and the live homepage. Finally we wrap things up with a new mission: helping players communicate using their poker data. Live streaming has become a major part of the online poker community over the past few years. Poker fans have enjoyed watching their favorite poker players as they make deep runs in online tournaments or mix it up in the the world of high stakes cash games. Hosted primarily on the gaming website Twitch.tv, poker streaming routinely cracks the “Top 10” in viewership and has introduced thousands of new players to the game. Before streaming on Twitch became a popular pastime, following online poker came with a steep learning curve. Even knowing who was playing required encyclopedic knowledge of hundreds of faceless usernames and the ability to decode arcane jargon and statistics. Live streaming on Twitch changed all this by introducing the human element to the online game. Showing the game from the perspective of a streamer gave people someone to root for and a community of followers to share in the excitement. The interaction between the viewers and the streamer conducted through chat is key to this experience. This conversation between viewers and streamers and among the viewers themselves builds trust in the community and helps to educate the audience about what’s happening on-stream. Monitoring chat and answering the same questions over and over can often take a lot of time and attention. To help streamers manage, programs called “chatbots” can be added to any channel. Chatbots (such as Nightbot) let you program in responses to any number of commands. For example, you can find out how long a stream has been going with the !uptime command, or ask what song is playing with the !song command. However, these “general purpose” chatbots aren’t able to tell you anything about the poker being played. This limitation means that many questions go unanswered. Five months ago, we started work on a solution for this problem and today we’re proud to announce the launch of Live streaming with Pokeit. Pokeitbot can also be configured to automatically post new hands and tournaments to chat after they finish. Check out the bot commands page for the full list of commands along with example responses. Pokeitbot commands can also be accessed directly from our live streaming API. After enabling the API through your account page, commands can be run directly from your browser by visiting a web address. The API is helpful if you’re already using a chatbot such as Nightbot and don’t want to add a second bot to your stream. For a full list of API endpoints, as well as instructions for adding custom Pokeit commands to Nightbot, visit the bot API page. The Pokeit web application is a powerful tool for gaining insight from your poker data through fully-customizable graphs and reports. We focus on graphs and reports, or visualizations as we call them, because seeing your data visually is often the best way to understand it. The second component of Live streaming with Pokeit is a live homepage allowing you to share the visualizations you create with your audience. Visualizations shared this way will update automatically as new data comes in. Timeframes can be added to limit the data displayed to a single session, week or year and other options include the ability to hide holecards, player names, and the hand histories themselves. That way, only the information you want out there will be shared. Live visualizations run off the same delay as Pokeitbot so everything you share remains in sync. For example, if you wanted give your followers access to all the hands you played this session, as well as a graph of your results, you’d share the “Hand Browser” and “Hands Graph” visualizations. Anyone with your Live streaming link will be able to view these visualizations while you’re streaming. We’ve also included several commands in Pokeitbot which provide information on what’s streaming on your page, along with links to the live content. When we started Pokeit, one of our original goals was to give poker players a better way integrate their own poker data into the conversations they were already having online. We wanted players to be able to share the insights they were gaining from their data with others just as easily as they swapped tips and strategy on poker forums. It’s this promise we deliver on with the launch of Live streaming with Pokeit and we look forward to hearing your feedback. Previous Previous post: Introducing Pokeit HUD beta!